The gradual change in the level of the Oceans and Seas. The rate that sea level is changing is called the trend in sea level. The sea level trend is presented as the height of change per year for example as mm per year. The amount of sea level rise has been determined globally from long term tide gauge records. Globally, sea level rise has been reported at an average rate of 1.8 mm per year for the past century and 1.9 mm/year from 1961 up to 2009. 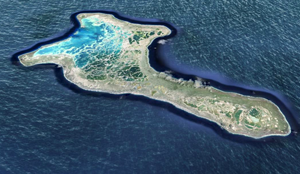 Since 1993, measurements from satellite radar altimeters have allowed estimates of global mean sea level. These measurements are continuously calibrated against a network of tide gauges. 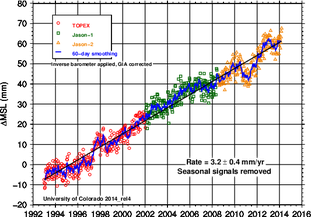 When seasonal and other variations are subtracted, they allow estimation of the global sea level trend. 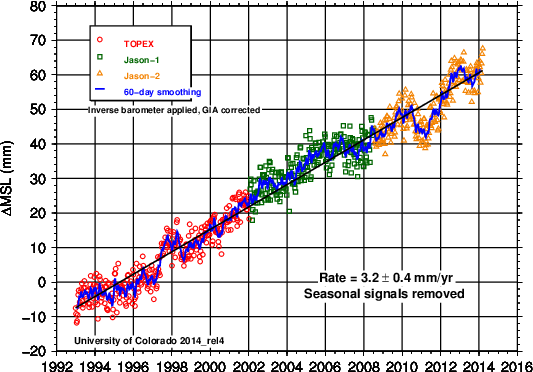 The global sea level trend from the beginning of satellite measurements in 1993 up to 2014 is 3.2 mm/year. The sea level trend for the period 1993 to 2009 calculated from tide gauge records is 2.8 mm/year very close to the satellite altimeter global sea level trend. In Australia, the trend in sea level has been calculated from long term averaged tide gauge records as 1.2 mm/year. The two longest tide gauge records at Fort Denison in Sydney harbour and at Fremantle in Western Australia indicate a slightly higher trend of 1.4 mm/yr at Fort Denison and a lower trend of 0.9 mm/yr at Fremantle. Both of these Australian determinations may include changes in the reference datum relative to the International Frame (IRF) due to the vertical movement of land.